Toyota Prius is gaining increased popularity among hybrid car owners mostly because of the attractive warranty the battery carries. The battery itself performs well and in addition to the battery’s satisfactory lifespan. The battery warranty offers to replace a faulty battery within the warranty period of 8 years or before the vehicle has run 100,000 miles. Once you inform the battery dealer of the faulty battery, it will be replaced free of cost with no questions asked. In most areas in the United States, the warranty for the Prius battery is for a period of eight years or 100,000 miles except in California where the warranty extends to 10 years or 150,000 miles. However, it is noticeable that the battery performs satisfactorily for seven to eight years and problems with the battery start to arise only when the warranty period has just expired. After eight years, the performance of the battery becomes very poor and stops to function altogether soon. Once the battery stops functioning after the expiry period of the battery warranty, you must replace the Prius battery at your own cost! There are some people who are keen on certain branded batteries but if you want your Toyota Prius in its original state, you have to go to a Toyota battery dealer to get a replacement. The battery doesn’t come cheap. A new battery will cost you around $4,000! If you are wise enough and don’t want to squander your money, you should think whether it is worthwhile to spend so much money on an old car. After eight years, your hybrid car would have experienced considerable amount of wear and tear. A better option is to buy a used battery for your vehicle. You can get a used Toyota Prius battery at a fraction of the cost of a new battery. What you need to do to get a used battery is to search on the internet for the relevant information. There are even local stores which deal in used Toyota Prius batteries. It doesn’t mean that buying a used battery is always safe and cheap. When you buy a used battery, you do not know how much of the battery life is left in it. The used battery you buy may stop functioning the next day and you will have to buy another one on the following day. If the dealer can guarantee life for the used battery at least for a couple of years, it is worth buying. Here is another option also open before you. You can rebuild your old battery and use it for some more years. The cost of rebuilding a battery is very low and you can do it yourself. If you search on the internet, you will get detailed instructions on how to rebuild the battery. If you think that you don’t have the technical knowhow and the time required to rework a battery, you can get help from a local mechanic to do the process for you. Give him the instructions to rebuild the battery and what you need to spend extra is on is the labor charges of the mechanic. Even after paying the labor charges, you will find that rebuilding your old battery is much cheaper and more reliable than buying a used or new battery. Do you want to know where to a get a Toyota Prius battery replacement guide? If you do, head over to www.hybridbatteryrebuild.com and learn how you can replace a Pruis old battery at a cheaper cost. 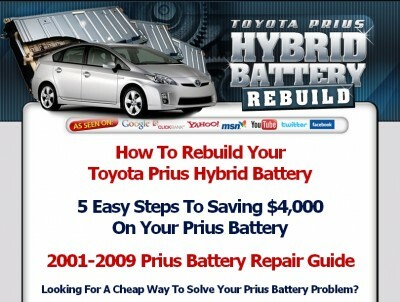 ==> Click here to get Prius Battery replacement guide! •	You may simply buy a new battery, this will cost you $ 3000 to $ 4000, this has to be avoided by Toyota to save their reputation. •	You may browse in eBay; there are some people who sell Toyota Prius batteries at almost half the market price, the price range is from $ 1500 to $ 2500. Since price seems to be tempting but you do not know exactly for much time battery has been used. •	The best option seems to be internet; you can get lot of guidance to build your own battery using old tools of the garage.